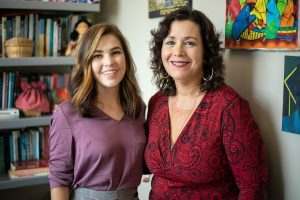 Two College of Arts and Humanities alumnae—Julia Jordan ’18 and Delia Shahnavaz ’17—had research essays published in issue 9.2 of The Pegasus Review: UCF Undergraduate Research Journal. The journal is highly selective, only accepting seven submissions per issue, but Jordan and Shahnavaz managed to stand out among the rest. Jordan’s article, “Code-Switching in Gloria Anzaldúa’s Borderlands/La Frontera: The New Mestiza and Sandra Cisnero’s Caramelo,” demonstrates the ways the two authors use code-switching to explore Latinx and Chicana identity. Shahnavaz also analyzes the work of a female writer in her article “Earthseed Planted: Ecofeminist Teachings in Octavia Butler’s Parable of the Sower,” investigating the connection Butler’s dystopian novel makes between a patriarchal society and a desecrated Earth. Student-researchers like Jordan and Shahnavaz, whose essays make it through an anonymous peer-review, work with professional mentors to fine-tune their essays. Farrah Cato mentored Shahnavaz, an English major. Jordan, who graduated with dual majors in English Literature and Political Science (Pre-Law), was mentored by Dr. Cecilia Rodríguez Milanés. The mentoring process begins months before an issue is published. Mentors read and grade the submissions and suggest edits, then send them back to their mentees for revisions. In some cases, the mentors will suggest colleagues their mentees could contact who have specializations in line with the mentees’ research. The end goal is to make the research papers as pristine as possible, with typically two or three readers giving feedback on each essay. While the process takes time, Milanés believes being published in The Pegasus Review is worth it. To learn more about The Pegasus Review and read Jordan and Shahnavaz’s essays, visit www.urj.ucf.edu.